Computer games have been around for about the last 60 years, today they are an integral part of our culture. Nevertheless we are running the risk of losing a part of our computer games heritage forever, because data storage devices and consoles are getting old. This is where libraries and museums can step in to relieve the situation. It is an autumn day in the year 2016. Several school classes have gathered at the Information Centre of the Frankfurt am Main Public Library. Not, however, to find a book to read, but to test new computer games. The pupils and teenagers are sitting at PCs and consoles, enjoying digital adventures and eventually awarding points for the games they liked best. The occasion is the awarding of the “Tommi” – the German Children’s Software Prize, an event in which about 20 public libraries from all over Germany take part. The jury is made up of 3,600 children and teenagers. The Children’s Software Prize serves as a good example of just how visible computer games have become in German libraries in the meantime. Since 2008 computer games have been officially classified as part of the country’s cultural heritage. It was the Deutsche Kulturrat (German Cultural Council), an umbrella organisation consisting of 246 cultural associations, that decided this, because artists from all kinds of fields – ranging from graphic designers and composers to screenplay authors – are all involved in the production of the games. It is now the task of the libraries to make the cultural heritage of computer games accessible for everybody. At the moment the libraries are still not able to provide an archive that is absolutely complete. Despite the fact that the German federal government expressly emphasised in its coalition agreement of 2013 that it wanted to “ensure that digital games would be available in the future for the generations to come”. What they did not realise, however, is that this statement would involve a task of mammoth proportions. In the first place, every year thousands of new games come onto the market. In the second place more and more of the games are in danger of being irretrievably lost forever. For example, because old data storage devices like floppy discs and CD-ROMs can now, decades later, no longer be read. Or because there are no suitable computers and consoles around anymore. Tobias Steinke is responsible for long-term archiving at the Deutsche Nationalbibliothek (The German National Library), where they deal with the storage of books and digital publications, which also includes e-books, websites and multimedia dictionaries. The statutes of the Deutsche Nationalbibliothek from the year 2006 stipulate that media of this kind are to be collected, archived and made available to the public. This, however, did not include a legal mandate on the long-term archiving of computer games, says Steinke. “Nevertheless, we do collect school textbooks, and this is where the line between them and learning games is particularly thin.” Steinke considers one of the main barriers to be the fact that “in Germany there is no institution that is officially responsible for the collecting of computer games.” It is above all the museums that have stepped into the breach, like the Haus der Computerspiele (House of Computer Games) in Leipzig or the Computerspielemuseum (Computer Games Museum) in Berlin whose collection in the meantime embraces more than 23,000 computer games. 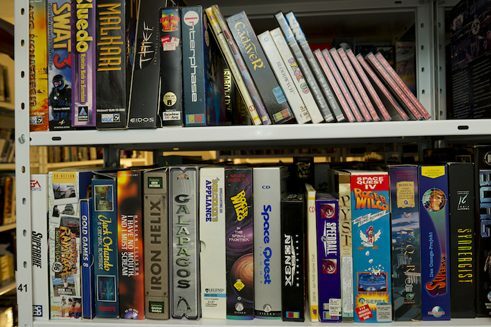 The second step towards long-term archiving focuses on the hardware and the operating system for which a game was originally programmed. Over the years hardware can get lost or damaged, the same applies to the operating system, too. In order to ensure that the old classic games can still be played, games fans have developed what they call “emulators” – software that simulates the functions of the old hardware and transfers them onto present-day computer platforms. The EU has also recognised the fact that the cultural heritage of computer games is in danger of being lost forever. That is why from 2008 to 2012 it sponsored the KEEP project (Keeping Emulation Environments Portable). The aim of this project was to make digital objects available over a longer period of time – by providing an overall “umbrella” standard for emulators. Long-term archiving is also the aim of Nestor, a network of German libraries, archives and museums. Nestor has organised a group of specialists entitled “Fachgruppe Emulation” in which Tobias Steinke of the German National Library and Andreas Lange from the Computerspielemuseum work in direct contact with each other, enabling them both to benefit from the exchange of knowledge and ideas. The fact that the emulation of multimedial works is meaningful and feasible was recently shown by the Emil project that was funded by the DFG (Gerrman Research Foundation). The long-term archiving of computer games is not just difficult from a technical point of view, but also from a legal one. German copyright law does in fact allow a backup copy of a game to be made, but no way is it allowed to get round the copy protection mechanisms that have been protecting the games in all kinds of ways for decades. The law, however, does provide one way forward – the copyright holders, i.e. the games companies – can be asked for their permission. Unfortunately many of the older games are so-called “orphaned works” – for which it is not clear who the current holder of the rights is. Attempts to determine who holds the rights are extremely time-consuming – and often not possible due to the lack of a centralised rights register. The guardians of our computer games heritage fortunately are not put off by this at all. As a result an archive is to be established in Berlin – the “Internationale Computerspielesammlung Berlin Brandenburg – ICBB” (The International Computer Games Collection of Berlin Brandenburg). The Computerspielemuseum, the Zentral- und Landesbibliothek (Central and Regional Library), the Universität Potsdam (University of Potsdam) and the Unterhaltungssoftware Selbstkontrolle (USK) (Entertainment Software Self-Regulation Body) are going to combine their stocks and resources for the ICBB. With its 70,000 objects it is going to be the largest collection of computer games in the world. The project is still in the planning phase. One of its aims is for ICBB users to be able to access the games via emulation. This would mean they would have a huge array of cultural treasures directly at their disposal. Digitalization puts libraries, museums and archives before new challenges. In order to preserve our cultural heritage, we need new strategies, says the jurist Paul Klimpel. Achim Fehrenbach works as free-lance journalist in Berlin for “Spiegel Online”, “Zeit Online” or “Der Tagesspiegel”. His focus is above all on technological issues and computer games.